Apex Legends has already proven itself to be a worthy contender to the Fortnite throne of dominance after hitting 1 million players in under 8 hours. The pressure kept rising as player counts soared to over 2.5 million in 24 hours. 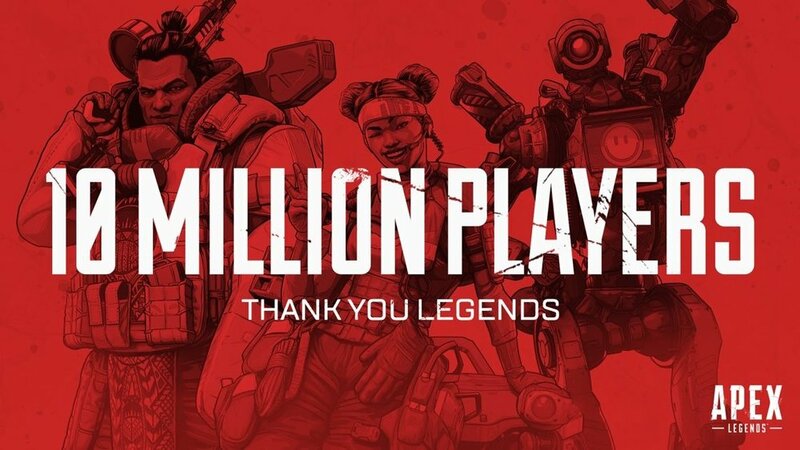 Now Apex Legends has broken the 10 million unique player mark in just 72 hours! To add even more celebration the game has also achieved 1 million concurrent players. Now these numbers are still small compared to the mega success of Fortnite which just broke the 10 million concurrent mark during a special Marshmellow concert event over the past weekend. But, for the first time in a while there seems to be viable competition in the BR genre which is great for us as the players! Hopefully Apex Legends can keep up its quick momentum and not fizzle out like so many that have come before! APEX LEGENDS Has Taken The Internet By Storm! APEX LEGENDS Craze Helps Boost Sales Of Steam VR Game APEX CONSTRUCT! PROJECT NIMBUS COMPLETE EDITION Makes Its Switch Debut Next Month!